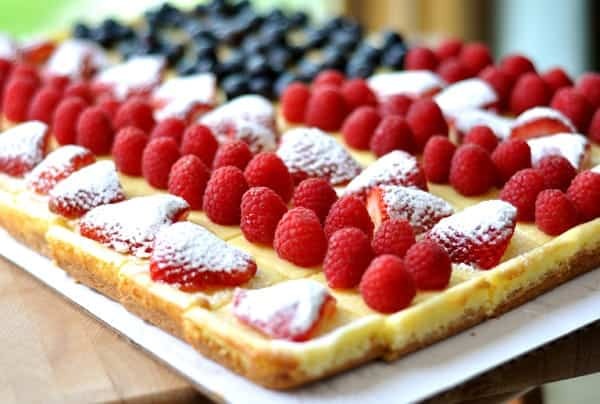 I love the idea of celebrating patriotic holidays with desserts crafted to look like the American flag but until now, I’ve never really attempted the feat. However, after assembling this fruited-cheesecake flag, I’m beginning to think edible flag craftmanship may be in my future. How’s that for a new hobby? This simple cheesecake is made ultra-delicious by a brown sugar shortbread crust. As with all cheesecakes, the crust is easily my favorite part and that is certainly the case here as well. 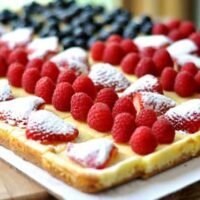 The creamy, light cheesecake filling is baked, cooled and topped with fruit to resemble the American flag. 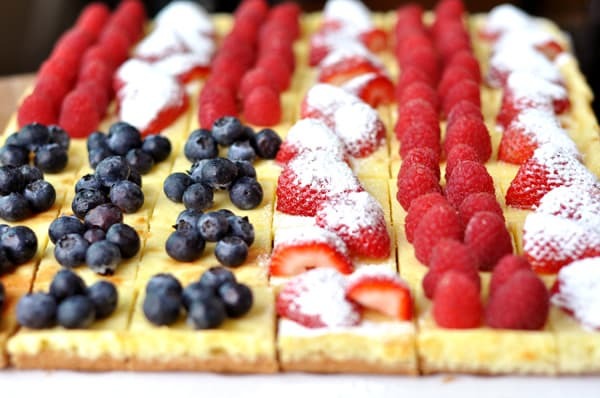 Biting into a square of luscious cheesecake topped with juicy berries is my kind of patriotic dream. Perfect for the upcoming 4th of July holiday, we enjoyed this for Memorial Day also, and I’m already thinking of ways to decorate this large cheesecake for other holidays, patriotic or not, because regardless of how stinking cute it looks, the cheesecake and buttery, sweet crust are delicious enough for any occasion. Coat a 13-by-18-inch rimmed baking sheet with cooking spray. Line with parchment, leaving a 2-inch overhang on the long sides. Coat parchment with cooking spray. Sift flour and 1 3/4 teaspoons salt into a medium bowl. In a large bowl, cream the butter with a mixer on medium-high speed, occasionally scraping bowl, until fluffy, 3 to 4 minutes. With the mixer running, slowly add light brown sugar, beating until very pale and fluffy, about 2 minutes. Add flour mixture all at once, and beat on low speed until just incorporated. Transfer the dough to the prepared baking sheet. Press the dough into an even layer that covers the bottom of the sheet. Cover and refrigerate until firm, about 20 minutes. Preheat oven to 300 degrees F. Bake the dough until the entire surface is golden brown, about 30-35 minutes. Let the cookie base cool completely in the baking sheet. Raise oven temperature to 350 degrees F.
In a large bowl, beat the softened cream cheese with a mixer on medium speed, occasionally scraping bowl, until fluffy, about 3 minutes. Reduce speed to low and add granulated sugar in a slow, steady stream. Scrape the bowl, then mix in lemon zest, vanilla and a pinch of salt until well combined. Scrape the bowl, then beat in the eggs, 1 at a time, until incorporated. The mixture should be very smooth; scrape the bowl as necessary. Pour the cheesecake batter over the crust and spread into an even layer. Bake the cheesecake until the filling is set, about 20-25 minutes. Let the cheesecake cool completely in the baking sheet. Refrigerate until firm and cold, about 4 hours (or overnight). Run a sharp knife along short sides of sheet, and use the parchment overhangs to lift out the cheesecake. Run the knife under hot water and dry well. Use it to cut the cheesecake into 48 squares, wiping the knife clean between cuts. Transfer squares to a serving platter, reforming the rectangle. Decorate the top left squares (3 down and 4 across), with a mound of blueberries on each square. Use raspberries (about 4 per square) to decorate the 1st, 3rd and 5th rows (the 1st and 3rd rows are shorter rows since part of them are decorated with blueberries). Decorate the remaining rows in one of two ways: either dust them with powdered sugar for a completely white row or place three cut strawberries on each square and dust the tops of the strawberries with powdered sugar. If using this method (to dust the strawberries with powdered sugar), dust the strawberries immediately before serving as the powdered sugar will begin to dissolve into the juiciness of the strawberries. Serve immediately (or refrigerate for up to 3 hours). For truly white stripes, cover alternating rows with just confectioners’ sugar rather than lightly dusted strawberries. Also, the cheesecake (without being topped with fruit) can be made up to a day in advance and kept well-covered in the refrigerator. We are following your site very well. Wonderful site. Plenty of useful info here. I’m sending it to a few pals ans also sharing in delicious. And obviously, thank you on your sweat! A classic hit! Can always count on your recipe site to have what I’m looking for. This is the second year I’ve used your recipe, and this year I decreased the salt in the crust to 1 1/4 tsp. No one noticed a difference but me :), but I liked it better (probably due to my notorious sweet tooth). Thanks again. I made this for 4th of July and it was AMAZING! It was such a hit with everyone! Thanks for the wonderful recipe and this will be a definite go to dessert from now on. Mel, I just baked the cheesecake and LOVE the way the crumbs from the knife tasted! I can’t wait to eat it with the fruit. It is in the refrigerator right now and I wish I could eat a whole piece. Instead of cutting into 8 “squares” across and 6 “squares” down, I cut it into 8 x 7 pieces so I could have a red stripe across the bottom of the flag and it balances out just fine. Thank you for the incredible recipe, edible stars and stripes cheesecake–so exciting to look at and yummy in the tummy! I agree with Lisa! You need to create cookbook. I’d buy it. this is definitely a winning independence day creation. nice use of powdered sugar, too–you’re a clever one, mel! Love, love, love your website. I just found it last week and have had so much fun trying your recipes. You need a cookbook! Call Deseret Book. They have done so well with Our Best Bites I think you would be the next big thing!! I love the idea of using the powdered sugar for the white stripes, so creative. I just made a fruit pizza with frugal pizza crust and cream cheese frosting on my blog this week. Thnx for the idea. Mel- I’m a newbie to your blog and I love it!! Your recipes are mouthwatering!! And I love your special section for “the best recipe”. Thanks for sharing! Looks absolutely delicious, Mel. What’s better than fresh fruit with cheesecake? And I love that the cheesecake is thin. I can never finish a thick /deep slice. I HATE to waste desserts! So fun! This will be the perfect treat for our family BBQ! Thanks! Looks delicious! So smart of you to cut it before adding the berries! Wow, mouth watering, must make cheesecake…with berries! What a hoot! I once made a flag from Spam and Velvetta with blueberries. What fun. My daughters’ birthdays are the 3rd and 5th of July so this is a perfect dessert for their party. Thanks, can’t wait to try it.